The older I get the more I like! I used some yummy chopped dates--very good. I thought they were excellent. They will be even better with frosting. I also love silpat. I put them on my Pampered Chef stone and I get perfect cookies every time. I know I'm going to have to make these cookies again just for the cream cheese icing! Such a good recipe. I thought I was the only one that didn't love carrot cake! Glad to know there are others. But I did love these cookies. I like that you frosted yours!! And I love my silpat too! How interesting that the silpats produce a better looking cookie. I love my silpats. Your cookies look delicate and preet with their icing! I love the idea of adding oatmeal. I had no idea that silpats would affect the cookie. My list is on Amazon, so will have to add one/two or more of these. Thanks. they are so cute with the little kiss of frosting...i'd ingest too many, too! 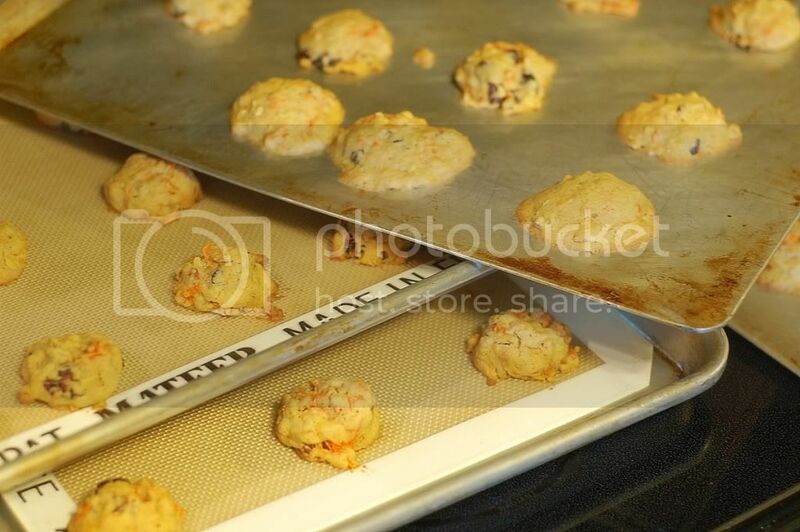 i would never grease a cookie sheet...that's what silpats and parchment are for! WOW!! 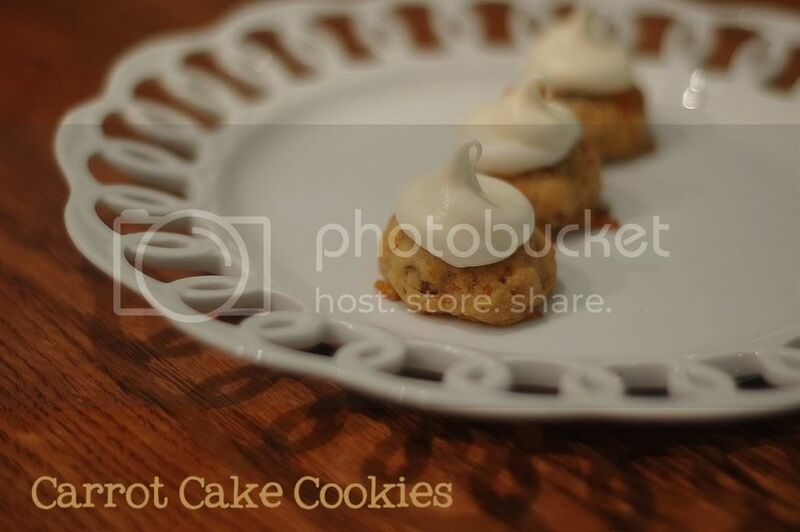 Your cookies look insanely good and the frosting was definitely the right call! Yum!!! John's grandpa loves carrot cake! I will have to make these for him sometime. And I love my silpat liner. I accidentally got the giant one with a gift certificate when we got married. I thought it was the smaller ones, but I love the big one for making rolls, kneading pizza dough, and rolling out pie crust. i could eat a handful! Ciao Anne !Thank you for joining me this week I love your silpat collection !!! Coconut is to Anne as onions are to Katrina and raisins are to your mom. These were not my favorite cookie, but surprisingly pretty good--especially since I, too, slathered copious amounts of cream cheese frosting on mine, too. I thought the ginger was too strong and would have rather had a little cinnamon with less ginger. Someone gave me a Silpat once and I didn't really like the results. 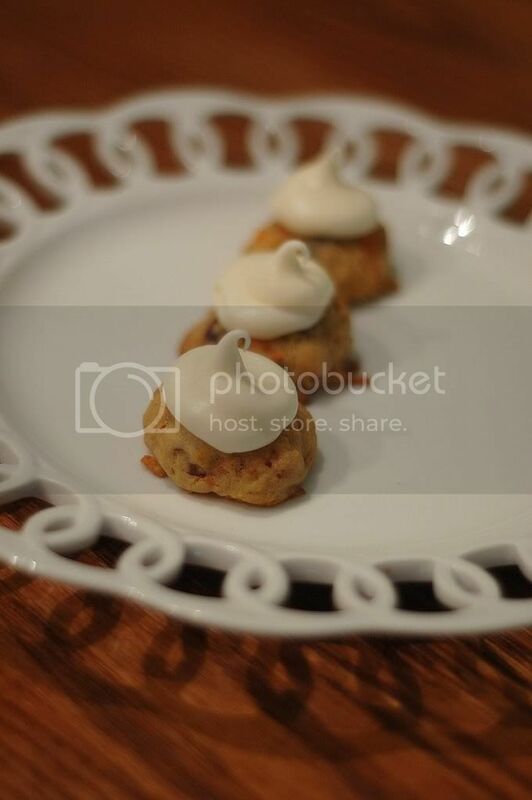 Your dainty little cookies look gorgeous with that big dollop of frosting! I made mine as unhealthy as possible, but they sure were good! Yours are so cute with the frosting! I wish I would have gone that route. You managed to get the perfect little peak on your cookies. How clever! I can relate to the whole carrot cake issue. So I was surprised at how much I loved these. oh my! these are adorable. These look great! I love that the icing is as big as the cookie! Those sound so yummy and I love the idea of craisins instead of raisins.